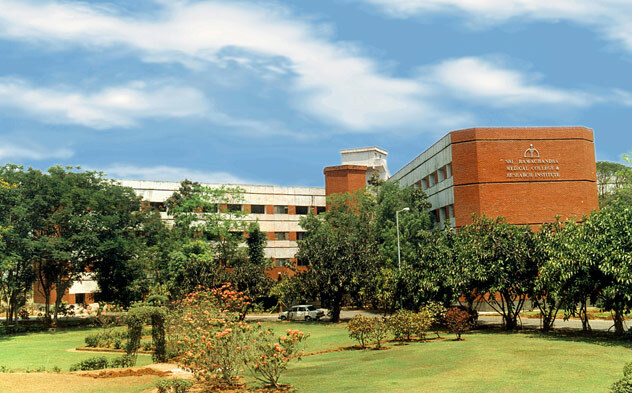 Sri Ramachandra Institute of Higher Education and Research (Deemed to be University), ranked among the top health sciences universities in India, had its origin as Sri Ramachandra Institute of Higher Education and Research which was established by Sri Ramachandra Educational and Health Trust in the year 1985 as a private not-for-profit self-financing institution and dedicated to serve the society as a centre of excellence with emphasis on medical education, research and health care. The Trust achieved the task of establishing the Institution as a “Centre of Excellence” under the leadership of Late Shri. N.P.V.Ramasamy Udayar who was the Founder & Managing Trustee of the Trust and also the first Chancellor of the Deemed to be University. Shri. V.R. Venkataachalam is currently the Chancellor of the Deemed to be University and is also the Managing Trustee of the Trust. In view of its academic excellence, the Government of India declared Sri Ramachandra Institute of Higher Education and Research as a Deemed to be University in September, 1994 under Section 3 of the University Grants Commission Act, 1956. As required by the UGC, a separate and dedicated Trust, “Sri Ramachandra University Trust” was created in 2012 to run the Deemed to be University, fully complying with the UGC norms. Over three decades, the institute has transformed into a full-fledged Deemed to be University with nine Constituent Colleges / Faculties – Sri Ramachandra Institute of Higher Education and Research and Colleges of Dentistry, Pharmacy, Nursing, Physiotherapy, Allied Health Sciences, Management, Biomedical Sciences, Technology & Research and Public Health offering 104 U.G. and P.G. courses in health care sciences, with a faculty strength of 836, with 6501 students receiving teaching-learning training under them,(Faculty: Student ratio 1:8) during the academic year 2017-18. The National Assessment and Accreditation Council has reaccredited (cycle-2) Sri Ramachandra Institute of Higher Education and Research (Deemed to be University) with “A” Grade with a CGPA of 3.62 on a 4-point scale, the highest to be awarded to a private medical University in India. The Joint Commission International (JCI) has reaccredited the hospital, the first teaching hospital in India to obtain such accreditation from JCI. Similar reaccreditation has also been received from the National Accreditation Board for Hospitals (NABH). The Medical Council of India (MCI) has recognized and upgraded the Regional Centre in Medical Education Technologies, Sri Ramachandra Institute of Higher Education and Research (Deemed to be University), as a Nodal Centre to conduct both Basic and Advance course in Medical Education Technologies. The WHO has designated Sri Ramachandra Institute of Higher Education and Research (Deemed to be University) as a WHO Collaborating Centre for Research and Training in Occupational Health. Sri Ramachandra Institute of Higher Education and Research (Deemed to be University) is located in Porur, on the busy Chennai – Bangalore highway, a twenty minute drive from the Chennai international airport. Chennai is a busy metropolis situated at head of sixty miles of pristine beach in the Bay of Bengal. Chennai is a fast growing industrial, medical and knowledge hub in South India that retains its charm, tradition and culture. It is well connected by road, rail and air to almost any destination in the world. The infrastructure at the University has been created to provide its students the best educational environment in the country. Over two million square feet of constructed space houses technologically advanced, fully air-conditioned state of the art class rooms, modern laboratories and one of the largest medical libraries in the region - the Central Library Learning Centre. Spread over 150 acres, the University is housed in a refreshingly green campus. Well manicured lawns, sprawling open spaces and trees dot the campus. The campus itself is a township with colleges, the medical centre, staff and student housing, conference facilities, play grounds, multi cuisine restaurants, ATMs, gift shops, travel service, railway reservation counter and a post office.